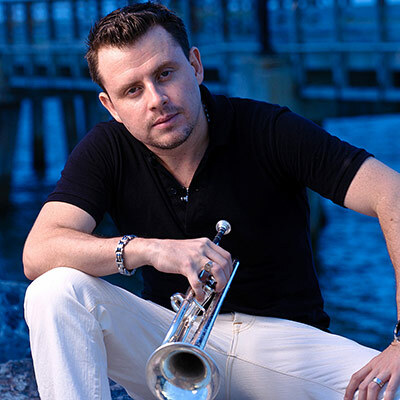 Jose Sibaja is one of the most highly acclaimed Costa Rican trumpet players of his generation with worldwide audiences and broadcast media in the Classical, Latin, Jazz, and Pop musical genres. His career ranges from international appearances as an orchestral soloist with Springfield Symphony Orchestra, Orquesta Sinfonica Venezuela, and Orquesta Sinfonica Nacional de Costa Rica, to worldwide tours with Ricky Martin for the Vuelve and Living la Vida Loca tours. Currently, Jose plays lead trumpet with the world renowned Boston Brass. Receiving his musical training at the New World School of the Arts and the University of Miami, Jose’s vast musical repertoire and his masterful artistry make him a prominent figure in a new generation of musicians. He has held positions as principal trumpet with the Miami Symphony, the Sinfonieta de Caracas and Orquesta Sinfonica Venezuela, as well as a position with the Dallas Brass. With televised performances on the American Music Awards, the MTV Awards, the Grammy Awards, and the Latin Grammy Awards shows as well as appearances on Conan O’Brian, Saturday Night Live, The Tonight Show with Jay Leno, The Today Show, Late Night with David Letterman and numerous television appearances in more that 40 countries; Jose’s talents are not limited to live audience performances. Having recorded with such artists as Ricky Martin, Alejandor Sanz, Luis Enrique, Rey Ruiz, Tito Nieves, Celia Cruz and Gloria Estefan among others; Jose Sibaja redefines the idea of a concert artist with a rich mix of stylistic genres surpassing the very stereotype of today’s classical musician. Most currently Mr. Sibaja can be heard with the Boston Brass on their Latin Nights CD. Having held a faculty position at Carabobo Conservatory in Valencia, Venezuela; Mr. Sibaja currently serves as a clinician with the Boston Brass for the Jupiter Company, giving master classes as an Educational Ambassador worldwide. Proclaimed internationally as “a major young talent, the next Wynton Marsalis”, Jose played his solo debut at age 17 with the Springfield Symphony Orchestra and only five years of trumpet and music training. Jose Sibaja is indeed one of the world’s most unique trumpet soloists.